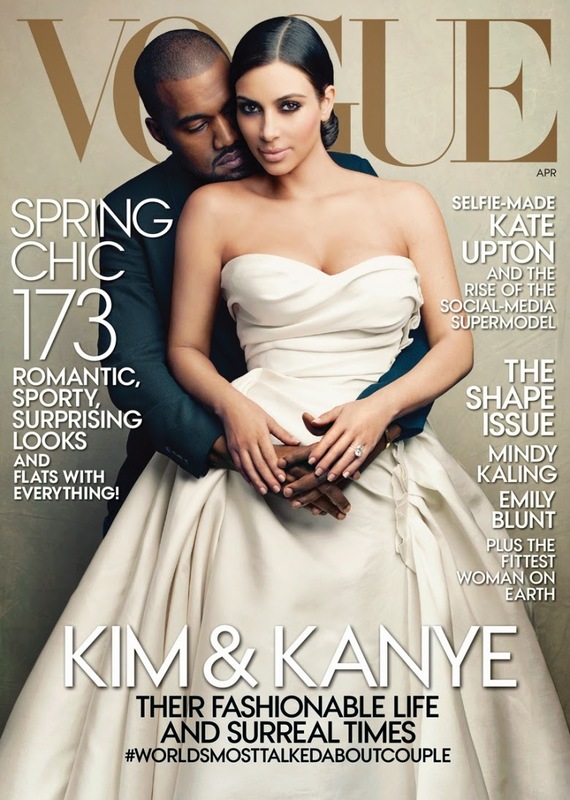 First let me say that this cover came out great, Kim Kardashian looks stunning in that Lanvin dress with her dapper Fiance Kanye West in Saint Laurent holding her tenderly. They look super cute on the cover. I've read lots of things that people had to say about the cover and it was as expected not positive, some were claiming that vogue has gone too low and that this cover is the end of the world, vogue and Anna Wintour. To be honest I don't get the fuss, I mean hasn't Vogue US been putting celebs on their cover for years now?The last model on a Vogue US cover was Kate Upton back in June 2013 and before that it was Kate Moss who graced the September Issue in 2011. Apparently Anna Wintour once said that she saved Vogue by putting celebrities on the cover. I don't think there would be a fuss if Mindy Kaling or Emily Blunt would be put on the cover (they're both featured in the issue) and no, I am not comparing them to Kim K. but still. Sure you don't have to like the cover, but why would people say all these nasty things, claiming she's a pornstar.. Come on. She made an adult video with her boyfriend in 2003, that's eleven years ago, and it leaked in 2007. Everybody makes mistakes but still everyone just can't seem that let that one go. We all know everybody just loves to hate Kim Kardashian. The cover of this April issue was shot by Annie Leibovitz, and will be available on March 30th.